As I have done a few times in the past, I got together with some friends for a wine trip to Napa and Sonoma just before New Year’s. This time we had a larger group than on our previous trip – “regulars” Jane, Warren, and Dean plus Kyoko, Mary, Jeff, and Pam. We stayed again at a timeshare facility in Windsor, located between Santa Rosa and Healdsburg. It’s a convenient spot, less than a mile from the freeway, and we’re frequently entertained by the geese and emus at the small farm just across the road. 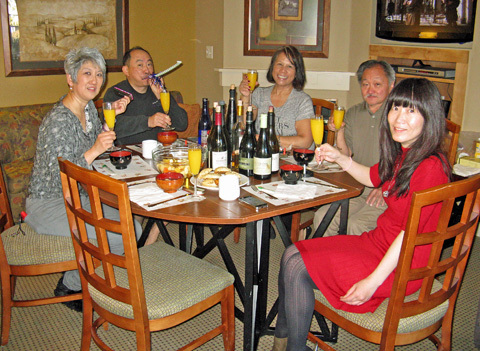 The location made a fine base from which to explore wine country, and the pleasant and roomy timeshare units allowed us to gather for “home-cooked” breakfasts and dinners and to relax together in the evenings. The weather was both good and bad news – it was beautifully sunny, and warmer than our last end-of-the-year trip, but this was also a sign of the ongoing California drought that’s causing concern to grapegrowers and everyone else too. Jane and Warren had arrived in Windsor on Saturday and visited Vincent Arroyo Winery near Calistoga on Sunday, while Kyoko and Mary had joined them later that day. I started out from Oakland early on Monday morning and dropped off my things at the timeshare, then we all squeezed into my car for the drive to our first winery visit of the day at Lagier Meredith Vineyard. Lagier Meredith 2011 Syrah, Mount Veeder, Napa Valley. Medium-dark purple, with blackberry fruit along with a big savory, meaty component, black pepper, a touch of flowers, and a saline, minerally note. Medium-bodied with a lively texture and moderate tannins, surprisingly approachable for such a young Syrah, nice. Lagier Meredith 2011 Mondeuse, Mount Veeder, Napa Valley. Medium-dark color, this had more forward raspberry and plum fruit than the Syrah, plus lots of spice and dried herb aromas. Medium weight on the palate, this seemed a bit less rich in body than the Syrah, finishing with slightly rougher tannins. Lagier Meredith 2011 Malbec, Mount Veeder, Napa Valley. Dark color, showing a dried herb/tobacco component, blueberry fruit, earth, pepper, and a chalky, minerally note. Richer mouthfeel and structured for the long haul, with big but broad tannins on the finish – needs more time but should develop nicely. 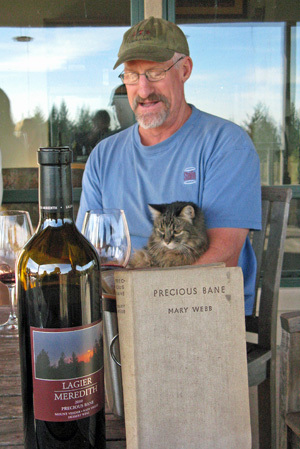 Lagier Meredith 2010 “Precious Bane,” Mount Veeder, Napa Valley. Dark color, intense ripe plum and spice aromas plus hints of earth and flowers. Rich and thick, this had a long tasty finish with fine tannins, a very pleasant dessert wine. We made the drive through Santa Rosa and into the Valley of the Moon, turning onto twisting Trinity Road to take us high into the Mayacamas Mountains. With the warmer weather, there was no need to be on the watch for ice on the road as we’d had to do the previous year. After crossing the crest of the mountains and continuing a short way down the eastern side, we turned south along Dry Creek Road. We were supposed to meet Dean, Jeff, and Pam at the base of the private drive that leads to Lagier Meredith Vineyard, but we soon found that Dean was running late and that Jeff and Pam had thought we were meeting farther up the hill. So we proceeded on our way up the long, narrow, and steep drive – always an adventure, and even more so for first-timers Kyoko and Mary! We met Jeff and Pam, waiting for us just outside the vineyard gate at the top of the drive, and we all headed the short distance further to Steve Lagier and Carole Meredith’s house, on a knoll overlooking their vineyard. We found that it was noticeably warmer there on top of the hill than farther below, where the cold morning air had settled. Steve and Carole welcomed us to their home, and we started our visit with a brief walk down the hill to their old house, which overlooks part of the vineyard and has a spectacular view across Napa Valley and the Vaca Mountains to the east. Steve and Carole’s vineyard is in part of the overall Napa Valley appellation, but this is hardly a valley site. 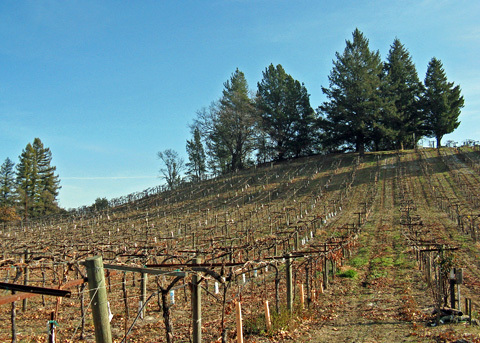 The hillside location is right along a mountain ridge, within the Mount Veeder AVA. Home to the highest-elevation vineyards in Napa Valley, Mount Veeder became an AVA in 1993, though winegrapes have been grown there as far back as the 1860s. Carole told us that Donald Hess of The Hess Collection was the driving force behind the AVA’s establishment. Besides the steep hillside slopes, the growing region is known for ancient seabed soils pushed up to the surface as well as for the cooling effects of San Pablo Bay (which can be seen to the south from Steve and Carole’s house). Before he turned his full attention to Lagier Meredith in 1999, Steve had been a winemaker with Robert Mondavi Winery for 14 years. Carole had been a well-known professor at the Viticulture and Enology Department at UC Davis before retiring from that position in 2003. She's one of the pioneers of analyzing grapevine DNA, a field that is now revealing many surprising relationships between various winegrapes. Carole identified the parent varieties of Chardonnay, Cabernet Sauvignon, and Syrah, and she’s particularly known for uncovering the origins of Zinfandel – a Croatian grape variety called Crljenak Kastelanski. Appropriately, Lagier Meredith’s Zinfandel is labeled as “Tribidrag” – Carole told us that this is actually the oldest known name for the variety, dating back to the 13th Century. Steve and Carole currently make their wines at the Monticello Vineyards facility in Napa – which means tough trips with loads of fruit down the steep road from the vineyard – but it has long been their dream to have their own winery at their property. They’ve talked about locating it where their old house now stands, and they told us some exciting news on this visit – they’re hoping to break ground on their new winery in 2014! They’re not yet sure whether they will build out the entire building all at once or just start with a portion of it. Either way, this will be a big step for Steve and Carole and should make their winemaking much more convenient. As we looked over the vineyard from the deck of the old house, I asked Carole what had been on their property when they bought it. She said that the house and a windmill were already there, and that there had been another house a bit farther down the hill from there as well, where the land had been cleared decades earlier. The owner of the property prior to Steve and Carole had cleared other portions to show prospective buyers that the site could be used as a vineyard or horse ranch – these cleared parts are where the vineyard has been planted. They did do some additional work to remove tree roots in order to rid the property of potentially lethal oak root fungus. Dean had finally arrived, and we all walked back up to the new house. 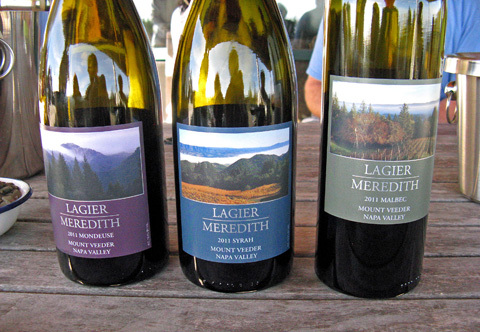 Since the weather was so nice – unlike the cold, windy morning we’d experienced there the previous year – we thought it would be perfect to sit out on the deck to taste through the current Lagier Meredith wines. 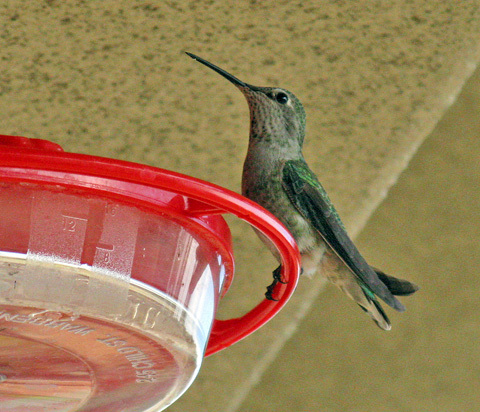 We couldn’t help but notice the number of hummingbirds enjoying feeders below the roof of the deck – I’ve never seen so many of them, and the birds didn’t seem concerned with all of us being so close. We were also joined on the deck by Steve and Carole’s cats, Spike and Mickey – at 17 years old, they’re slowing down but as friendly as ever. And as usual, Carole brought out some tasty almonds from Steve’s family’s farm in the San Joaquin Valley and olives from a small grove of old olive trees near the house. Carole proceeded to open the Lagier Meredith 2011 Syrah, Mondeuse, and Malbec (the Tribidrag and the 2012 Rosé were already sold out). As was the case in much of California, the cool 2011 growing season led to a small harvest at Steve and Carole’s vineyard, though they still had to thin the crop on their vines several times. With the small crop, the production of 2011 vintage wines was also very low – only about 350 cases of Syrah, 100 of Mondeuse, and 30 of Malbec. All of the fruit for the Lagier Meredith wines is destemmed and goes into one-ton t-bins, with no cold soak before fermentation or extended maceration afterwards. All of the wines are aged entirely in older barrels. Carole started our tasting with Lagier Meredith’s flagship wine, their Syrah – I thought the 2011 was more approachable at this stage than the 2010, while showing a more savory and peppery character than usual. I expect it will age very well, as Steve and Carole’s Syrahs always do. At 13.7% alcohol, it’s the lowest alcohol Syrah they’ve made. Next was the Mondeuse. Carole told us that their Mondeuse vines produce a lot of grape clusters, and they remove up to ? of the fruit prior to harvest – she said the vines are not overly vigorous but they produce so much fruit that it takes more work to keep them in balance. I thought there was more obvious distinction between the Mondeuse and Syrah in 2011 compared with the first two Mondeuse releases, though the varieties are related so perhaps it’s not surprising that there would be some similarity. The Lagier Meredith 2011 Malbec is the first release from their own vines. The Chester’s Anvil Malbec comes from nearby Brandlin Ranch (Steve and Carole got their cuttings from there). Carole feels that Mount Veeder is a particularly good spot for Malbec, with good fruit coming from Brandlin Ranch and from Hess Collection. It’s actually the second most-planted variety in the AVA, behind only Cabernet Sauvignon. Steve and Carole’s initial Malbec certainly lends credence to her view, and I’d expect even better ones as the vines gain maturity in the coming years. As we were finishing our tasting of the three 2011 wines, Steve asked us a couple of times if we’d like to try some of their 2010 Syrah dessert wine, called “Precious Bane.” It seemed like he really wanted to open a bottle for us, and he didn’t need to twist our arms too much. As Steve retrieved a bottle, Carole told us that he enjoys some “Precious Bane” after dinner, and that they’d recently finished a bottle so this was Steve’s way of getting himself a new one! The name of the wine comes from the title of a 1924 novel written by Carole’s great aunt Mary Webb. It’s a Port-style wine, with neutral spirits added to the fermenting Syrah and finishing at 18.5% alcohol and 7.5% residual sugar. As we sat around the table, we continued talking about a few topics of interest. Steve told us that he’s not yet overly concerned about the lack of rain in the past year but will be more worried if the dry weather continues another year. He mentioned that there are springs on their property and that the rocky soil has good water retention, so there’s a good water supply below the ground, and the vine roots go deep. And Steve and Carole told us about a humorous side effect of their 2010 Syrah recently being named #30 on the influential Wine Spectator list of the year’s Top 100 wines. They said that nearly as soon as the list was made public, they started receiving a constant flow of emails from companies that make award plaques! Still, that sounds like the type of annoyance that Steve and Carole would be happy to deal with every year. We were having such a good time talking with Steve and Carole that we’d lost track of the time, so we quickly had to say goodbye and head back down the mountain. Visiting Lagier Meredith has become an annual event for me, and it’s one that I always look forward to. Steve and Carole are both charming and generous hosts, with a wealth of knowledge about grapes and wine, and terrific senses of humor as well. It’s great to see their 2010 Syrah recognized as one of the top wines of the year, an honor I’d say they’ve also deserved for many of their past vintages. 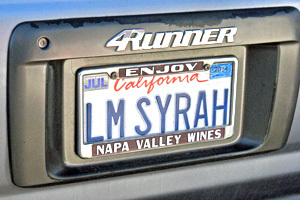 Their Syrahs have been consistently among the best in California for many years, and the newer additions to their wine line-up are winners too. It was wonderful to hear the news that they will finally be getting their new winery started this year. Steve and Carole truly are Lagier Meredith – they do nearly everything themselves (“no employees, no consultants, no partners, no investors”) so it will be quite an achievement for them to finally have their own winery next to their vineyard high on Mount Veeder. I’m looking forward to seeing how it’s coming along on my next visit! Jane had made lunch reservations for our group at Farmstead Restaurant in St. Helena, but we were running late after our visit to Lagier Meredith. When we arrived at Farmstead, we found that they’d given up our table but that another one would open up before too long. We weren’t sure of anywhere else to go that could accommodate our large group on short notice, and we were further persuaded to wait by the offer of glasses of their Long Meadow Ranch Sauvignon Blanc while we waited outside. Fortunately it was not a long wait, and we enjoyed a very good lunch at Farmstead. Unfortunately we were now running so far behind schedule that I had to call to cancel a winery appointment I’d set up for that afternoon. 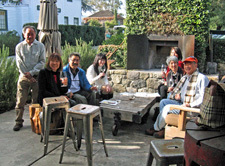 Discussing where we might go instead, Jeff suggested Beringer, as he was a member of their wine club and had wine to pick up there – and as it turned out, Kyoko was also a member of Beringer’s wine club. That made our decision an easy one. Beringer 2012 Chardonnay, “Luminus,” Oak Knoll District, Napa Valley. Light straw color, displaying citrus, spice, and vanilla/oak on the nose. Medium-light bodied with a good acidity, the oak stood out the finish, suggesting that some time might help to integrate the elements of this wine. Beringer 2007 Merlot, Bancroft Ranch, Howell Mountain, Napa Valley. A little Cabernet Sauvignon and Cabernet Franc blended in. Medium purple color, with a big vanilla/oak component along with black cherry and plum fruit, mocha, and spice. Medium-full bodied, finishing with tannins that still need time to settle down. Beringer 2005 Cabernet Sauvignon, Bancroft Ranch, Howell Mountain, Napa Valley. Medium purple color, this featured currant and darker fruit, dried herbs, spice, and well-integrated sweet oak. Fairly full-bodied and rich but lively on the palate, with chalky tannins, nice. Beringer 2006 Cabernet Sauvignon, Quarry Vineyard, Napa Valley. Medium-dark color, showing more woody oak aromas, dark berry fruit, smoke, and a touch of chocolate. Big and somewhat rough mouthfeel with a grippy tannic finish. Beringer 2006 Cabernet Sauvignon, “Private Reserve,” Napa Valley. 97% Cabernet Sauvignon, 3% Cabernet Franc. Medium-dark color, this had a strong herbal component along with currant and plum, smoke, spice, with vanilla/oak in support. Medium-bodied with a brighter texture, this had a lingering finish with refined tannins, nice. Beringer 2010 Cabernet Sauvignon, “Private Reserve,” Napa Valley. 100% Cabernet Sauvignon. Medium-dark color, with mocha/coffee, darker berry fruit, earth, and spicy oak on the nose. Richer mouthfeel than the previous wine with plenty of structure for aging, and chewy, youthful tannins on the finish. Clearly far too young but this could develop nicely. Beringer 1994 “Nightingale,” Napa Valley. 57% Sauvignon Blanc, 43% Semillon, 12.8% alcohol. Deep gold color, this displayed intense apricot, honey, butterscotch, and caramel aromas. Rich and thick on the palate, with a long and fairly sweet finish – this should continue to hold up well for years. Driving north along Highway 29 from St. Helena, it didn’t take us long to reach Beringer Vineyards. Beringer is one of California’s most historic wineries, with the claim of being the oldest continuously operating winery in Napa Valley. It’s listed as a California Historical Landmark, and the famous “Rhine House” at the property is on the National Register of Historic Places. The winery’s history goes back to 1875, when Jacob Beringer, who had arrived in Napa Valley a few years earlier from Mainz, Germany, purchased 215 acres of land with his brother Frederick. Jacob had become cellar foreman for Charles Krug by that time and was ready to strike off on his own wine venture. The Beringer brothers produced 18,000 cases of wine in their first vintage of 1876. Their original stone facility, now called the Old Winery, was started in 1877 and was built against a hillside to allow for gravity flow in the winemaking. A few years afterwards, Chinese workers completed the difficult task of digging tunnels into the hillside for aging the wines. Frederick passed away in 1901 and after Jacob died in 1915, Charles and Bertha Beringer ran the winery. Prohibition was looming, but Beringer was one of the few wineries that thrived during that period. They sold some sacramental wine to churches, which was permitted, but it was Bertha’s imaginative idea to sell “raisin cakes” to the public that really kept Beringer thriving during Prohibition. Naturally, buyers were explicitly warned not to put the raisin cakes in a jug, add water, and leave the mixture for 21 days, and Beringer even had to affix a warning label to their raisin cake packages – “Caution: Will Ferment and Turn into Wine” – wouldn’t want that to happen! This idea became hugely popular and was imitated by a number of other vintners during Prohibition. Soon after the repeal of Prohibition, Beringer became the first winery in Napa Valley to offer tours to the public. The Beringer family sold the winery and the Beringer label to Nestlé in 1971. It’s gone through a few ownership changes since that time, and is currently part of Treasury Wine Estates. 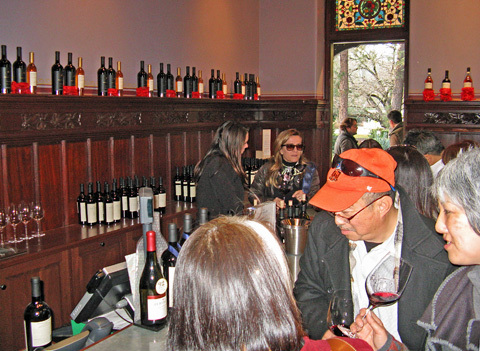 Beringer wines have been highly-regarded for many years. Myron Nightingale became the winemaker in 1971, leading to modernization of the winery’s equipment and techniques, as well as improvements to their vineyard sources. He began fermenting Chardonnay in French oak barrels, something that was not widely-done in California at that time. He also launched the Beringer “Private Reserve” Cabernet Sauvignon in 1978 – this has become the winery’s flagship bottling and has been recognized as being among Napa’s finest wines. Famed vintner Ed Sbragia joined the winemaking team in 1976, becoming winemaker in 1984. Two of his Beringer wines, the 1986 “Private Reserve” Cabernet Sauvignon and 1994 “Private Reserve” Chardonnay were named Wine of the Year by Wine Spectator. Drew Johnson, who heads up the vineyard management team, has been with Beringer in 1989 and now oversees over 1,600 acres of vineyards. Laurie Hook first joined Beringer in 1986 and took over as Beringer’s winemaker in 2000, while Ed Sbragia has continued his involvement there as winemaker emeritus. After pulling into the Beringer parking lot, we waited outside while Jeff and Kyoko checked on the tasting arrangements. They soon came back and told us that we would be able to taste at the winery’s reserve tasting bar located in the historic Rhine House. As we walked from the parking lot, we passed another historic house on the property – the Hudson House, dating from around 1850, was built by David Hudson, a member of the 1846 Bear Flag Revolt in Sonoma, which proclaimed California’s independence from Mexico. The Bear Flag, raised at the Sonoma Plaza, became the model for the current state flag. Just beyond the Hudson House is the Rhine House, built for Frederick Beringer in 1884, and designed in a style to remind Frederick of his family’s home in Mainz. We walked up the stairs into the beautiful old house and into the tasting room, which featured handsome wood paneling along the walls. We were able to taste a selection of Beringer’s top wines, including single-vineyard Merlot and Cabernets, “Private Reserve” Cabernets, and an old vintage of “Nightingale” dessert wine. We tried a Cab from Quarry Vineyard – located on the valley floor near Rutherford – and both a Cab and Merlot from Bancroft Ranch, at 1,800-foot elevation on the slopes of Howell Mountain. We also tasted two vintages of the “Private Reserve” Cabernet, the 2006 and the recent 2010 release. The composition of vineyard sources for the “Private Reserve” Cabernet changes from year to year – the largest proportion of the 2006 was from Bancroft Ranch while most of the 2010 came from Beringer’s St. Helena Home Ranch. Not surprisingly for a high-end Napa Cabernet, the wine is aged in 100% new French oak for about two years. We finished our tasting with a treat – an older “Nightingale” dessert wine. It’s named for former Beringer winemaker Myron Nightingale, who first started making the botrytised wine using his own technique to emulate the great French Sauternes. The Sauvignon Blanc and Semillon fruit is picked around 25 brix, and the whole clusters are placed on trays and sprayed with Botrytis cinerea spores – the fungus that creates the “noble rot” behind many of the world’s most famed sweet wines. After about 14 days, the grapes dehydrate, concentrating the fruit. The grapes are then pressed, and the wine is aged in French oak barrels. We tasted an intense 1994 “Nightingale,” made from 57% Sauvignon Blanc and 43% Semillon. I hadn’t been to Beringer in many years before this visit, so I have to thank Jeff and Kyoko for their suggestion to go there. The wines were fairly big and rich but did not strike me as over-ripe or overly-extracted, with alcohols right around the mid-14% range. I’d describe them as being near the middle of the Napa Cab spectrum, and leaning toward the more elegant side. The reds we tasted all showed very good structure, and the ones we tried from the 2005-2007 vintages still seemed to be on the young side – they certainly can stand up to many more years in the cellar. The 2005 Bancroft Ranch Cabernet and 2006 “Private Reserve” Cabernet were my favorites of the wines I tasted, and in time, the 2010 “Private Reserve” Cab may well equal or surpass those two. I don’t taste a lot of Napa Cabernet these days, but this visit to Beringer reminded me why it remains California’s signature wine. After our tasting at Beringer, we continued north past Calistoga, following Highway 128 back across the mountains and through Knights Valley, reaching Alexander Valley just north of Healdsburg. We headed back to Windsor from there, just as the late afternoon sun was starting to go down over the hills to the west. We shifted some furniture around in one of our two timeshare units so we could fit all eight of us around the table for dinner. Fortunately, several in our group love to cook – and unlike me, they’re very good at it! – so we always enjoy some great dinners together. Jane and Mary had started preparation for French onion soup and a pork roast the night before, so dinner prep was fairly easy once everyone got back to Windsor. Before our trip, we’d discussed a theme of 2008 and 2009 Pinot Noirs to go with dinner, and we opened some very good wines. We continued the food and wine theme afterwards, watching a DVD of Ratatouille and then playing a spirited game of Wine Wars (described as “a Trivia Game for Wine Geeks and Wannabes”). We played in teams, and Mary and I came away winners. We all got together again the next morning for a relaxing breakfast before heading out to our lone winery appointment of the day, a short drive away at Acorn Winery. Acorn 2012 Rosato, Alegría Vineyards, Russian River Valley. 40% Zinfandel, 33% Syrah, 11% Sangiovese, 8% Petite Sirah, 6% Einset, 1% Cabernet Franc, 1% Suffolk. Light pink/salmon color, featuring red fruits, spice, and fresh herbs on the nose. Medium-light bodied with a bright mouthfeel and clean finish. Acorn 2010 Cabernet Franc, Alegría Vineyards, Russian River Valley. 96% Cabernet Franc, 2% Merlot, 2% Petit Verdot. Medium purple color, this showed dried herbs, wild berry and plum fruit, and touches of black pepper, spice, and sweet oak. Medium weight on the palate with good structure and youthful tannins – needs time to develop but quite promising. Acorn 2011 Sangiovese, Alegría Vineyards, Russian River Valley. 98% Sangiovese, 1% Canaiolo, 1% Mammolo. Medium color, with intense bright cherry aromas along with spice, earth, and vanilla/oak notes. Medium-light bodied with vibrant acidity and moderate tannins, nice. Acorn 2010 Syrah, “Axiom,” Alegría Vineyards, Russian River Valley. 98% Syrah, 2% Viognier. Dark purple color, lots of spice along with blackberry, a touch of black pepper, and hints of flowers and sweet oak. Medium-bodied, with fairly grippy tannins on the finish. Acorn 2009 “Acorn Hill,” Alegría Vineyards, Russian River Valley. 54% Syrah, 44% Sangiovese, 1% Viognier, 0.5% Canaiolo, 0.5% Mammolo. Medium purple color, displaying a bigger vanilla/oak element plus plum and black cherry fruit and spice. Richer texture with good structure, this had a slightly stony mineral note on the palate, finishing with big but refined tannins. Acorn 2009 Alicante Bouschet, Alegría Vineyards, Russian River Valley. 98% Alicante Bouschet with 1% Petit Bouschet and 1% Grenache. Dark color, this had intense ripe dark berry fruit, spice, and a woody oak component. Big and mouthfilling, with a chewy tannic finish. Acorn 2011 Zinfandel, “Heritage Vines,” Alegría Vineyards, Russian River Valley. 78% Zinfandel, 13% Alicante Bouschet, 7% Petite Sirah, 2% other varieties. Medium color, with spicy raspberry and plum aromas, with touches of pepper, earth, and sweet oak. Medium-bodied and fairly restrained in style, this finished with moderate tannins, nice. Acorn 2010 “Medley,” Alegría Vineyards, Russian River Valley. 44% Syrah, 26% Cabernet Franc, 6% Cinsaut, 3% Zinfandel, 3% Sangiovese, 3% Dolcetto, 1% various Muscat varieties, 1% Mataro, 1% Merlot, 1% Petit Verdot, 11% other varieties. Medium-dark color, this featured dark fruits, spice, with notes of chocolate, earth, and flowers. Medium-full bodied with the structure for aging, and fairly big but refined tannins on the long finish, nice. It’s often tough to visit wineries on the day of New Year’s Eve – some are closed for the day and many more shut down early. 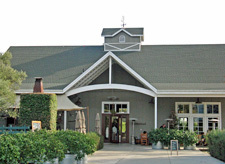 At Jane’s suggestion, we were able to make an appointment for that morning at Acorn Winery, located just off of Old Redwood Highway in Russian River Valley, a short distance south of Healdsburg. We overshot the small entry drive at first, but quickly made our way back. We headed up the drive and around a corner, parking in front of a modest wooden winery building next to the vineyard. 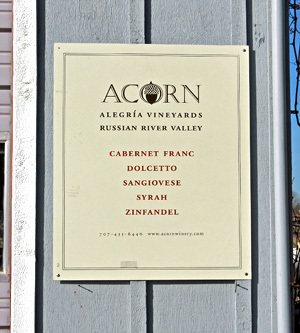 Acorn is run by Bill and Betsy Nachbaur, and is known for producing field blends – different grape varieties planted together in the vineyard and then picked and fermented together. Betsy was loading cases of wine into their SUV when we arrived – they’d gotten a rush order to be delivered that day. Bill came by and just had time to say hello before he drove off to make the delivery. Once that was done, Betsy welcomed us inside the building, where we sat down at a long table next to windows that overlooked “Acorn Hill,” where part of the vineyard is located. This was a informal and relaxing setting, and Betsy proceeded to tell us about the vineyard, winery, and wines while pouring us Acorn’s current releases. Bill’s family grew up in the Bay Area, and his family has roots in Sonoma County going back to the 1860s. His background is in law, and he had a career as an attorney in Washington DC and San Francisco. Betsy grew up on the East Coast, and worked there in public policy and banking. She told us that while she and Bill were living in the Washington DC area they were able to drink many great wines, thanks to their business expense accounts! Eventually, Bill decided he wanted to make a change in his life – he wanted to be able to spend more time outdoors, and with his increasing interest in wine, he liked the idea of growing grapes. After moving back to the Bay Area, he took courses on viticulture from noted instructor Rich Thomas at Santa Rosa Junior College. At the same time, he began searching for a vineyard site and in 1990, he and Betsy purchased their 32-acre property, which already included an old vineyard. Bill and Betsy named their vineyard Alegría, which means happiness or joy in Spanish. And the Acorn name came both from the oak trees on their property and from their being a small winery out of which big things can come – just like an acorn. For the first few years that Bill and Betsy owned Alegría Vineyard, they sold all of their fruit to other producers, but they began making their own wine in 1994, with their first release being a Sangiovese from that vintage. Betsy soon joined Bill in their new winery business, where she handles sales, marketing, and administration. They built their small winery building in 1995 and they’ve lived in a house there since 2003. Most of the wine is actually made at Mauritson Wines in Dry Creek Valley – Clay Mauritson is Acorn’s consulting winemaker, though Bill remains very much involved in both the winemaking and particularly in the farming of Alegría Vineyard. About 70-80% of Acorn’s sales are direct to consumer, and they schedule lots of tasting appointments – Betsy was even taking appointments for New Year’s Day while we were there. Acorn typically produces 7-8 different wines each year, and total annual production is around 3,000 cases. Alegría Vineyard is situated in relatively cool Russian River Valley, located less than a mile from the river itself. Although it’s in the warmer northern end of the appellation, Betsy noted that the diurnal swing at the vineyard can be 35-40 degrees, from the fog that often tempers the heat of summer days. Soil is alluvial loam and clay loam with some volcanic soil and river rock. As mentioned, there was already a vineyard on the property when Bill and Betsy bought it, with the oldest section of vines dating from 1890. Betsy said that the older vines were in good shape when they took over the vineyard, and that most of the fruit had previously been sold to Gallo. Like many old vineyards in the area, theirs was interplanted with a number of red grape varieties, and Bill liked the idea of continuing the old tradition of making field blends from these grapes. Bill added more vines over the years, with 27 acres now planted. 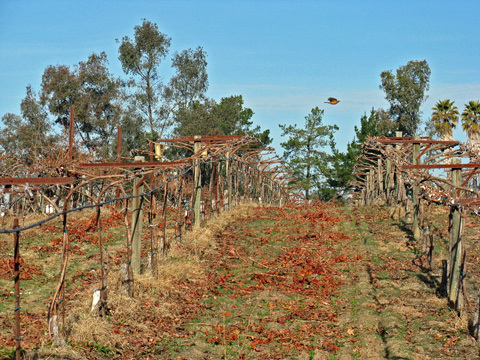 The vineyard is farmed sustainably, using mostly organic methods – they’ve never sprayed their vines with insecticides. The vineyard currently has around 60 grape varieties planted, and not even all of them are winegrapes. They range from the familiar (Cabernet Sauvignon, Syrah, Zinfandel) to varieties not often seen in California (Blue Portuguese, Petit Bouschet, Plavac Mali) to the downright obscure (Khir Ghulaman, Liatiko, Ramaily). A complete list of all the varieties grown at Alegría Vineyard can be found on the Acorn website. 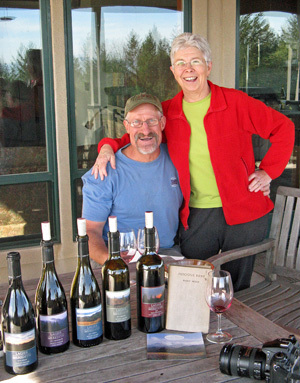 Bill and Betsy sell around a third of their fruit to other wineries – customers have included Ridge, Rosenblum, Rock Wall, and Stryker Sonoma among others – while keeping the rest for their Acorn wines. All of Acorn’s wines are field blends from their estate vineyard, and Betsy noted that farming is more key than winemaking for these wines, though of course both are important. Even though a few of the Acorn bottlings are over 90% of a single grape variety, Betsy feels that their wines represent place more than variety. The vineyard has a number of distinct blocks, each with their own mix of grapes, and they are all farmed a bit differently. The old 1890 vines are about 78% Zinfandel, along with other red varieties that were often interplanted with Zin at that time – their block includes 10% Alicante Bouschet, 10% Petite Sirah, and small amounts of Carignane, Trousseau, Sangiovese, Petit Bouschet, Negrette, Syrah, Plavic Mali, Tannat, Muscat Noir, Peloursin, Béclan, Mataro, Cinsaut, and Grenache, plus white varieties Palomino and Monbadon. Sangiovese vines were added in 1950 by Americo Rafanelli (of the well-known local wine family), who owned the vineyard at that time. Some of Bill’s more recent plantings include Cabernet Franc planted with small amounts of Merlot and Petit Verdot, Syrah planted with Viognier, and Dolcetto planted with Barbera and Freisa. Betsy poured our group tastes of all of Acorn’s currently-available wines, and in an interesting comparison, she had us sample most of the wines both from freshly-opened bottles and from bottles that had been opened the previous day and re-corked (but not gassed). The tasting notes here are from the freshly-opened bottles – as you might expect, the wines from bottles that had been opened the day before were a bit smoother and somewhat less fruit-forward, yet still showing fine vibrancy. All of the Acorn wines are reds, with the exception of the first one we tried, their Rosato. Like many of the winery’s field blends, the composition of this dry Rosé-style wine changes from year to year – the 2012 vintage is made from seven grape varieties, mostly Zinfandel and Syrah. Two pink-skinned varieties, Einset and Suffolk, were skin-fermented, while the juice from the other grapes – all early picks specifically for the Rosato – was left in contact with the skins for up to 24 hours before pressing. Fermented in stainless steel drums, the wine was then aged in older oak for three months. The first of the reds we tasted was Cabernet Franc, co-fermented with a little Merlot and Petit Verdot. This is one of the cooler-climate Cab Franc sites you’ll find in California, and it’s no surprise that the fruit has attracted other producers – Bailiwick and Ryme currently buy some. Bill planted the Cab Franc vines in 1991, and because of the cool site, he used a split canopy trellis to increase sun on the fruit zone and help tone down the overly green, herbaceous character that this variety can sometimes display. Next up was Sangiovese – a field blend featuring seven Sangio clones plus 1% each Canaiolo and Mammolo from a block that Bill planted in 1992 (Bill used budwood from the 1950 Sangiovese vines for this planting). Like all of the Acorn reds, the Sangiovese was fermented with both native and cultured yeast and was aged in both French and American oak (the Sangio, “Acorn Hill” blend, and Zin also get some Hungarian oak). Most reds see around 25-35% new oak, though a couple of them are aged in less than 20% new barrels. Both the Cab Franc and Sangiovese were among my favorites of the Acorn line-up. The “Axiom” Syrah was next, with three Syrah clones co-fermented with 2% Viognier. Following this was the “Acorn Hill” – a “Super-Tuscan” style blend led by Syrah and Sangiovese, the 2009 vintage that we tasted was only the second that the winery has produced. Made from selected barrels of the field-blended Sangiovese and Syrah, the “Acorn Hill” was aged in barrel for 21 months and in bottle for an additional two years before release. Betsy told us that the 2009 Alicante Bouschet was a “one-off” bottling of that variety, made because Acorn did not have enough Zinfandel left to make their own bottling that year after heavy October rains wiped out most of their Zin fruit. The Acorn “Heritage Vines” Zinfandel actually includes 18 different grape varieties from the vineyard’s interplanted 1890 vines. A bit riper than the other Acorn wines (most of them are under 14% alcohol), the Zin was still bright, expressive, and elegant. The final wine in the Acorn line-up was the “Medley” – this field blend is meant to highlight the vineyard, featuring up to 40 grape varieties. Most of these are included in very small quantities, from test plots of different grapes that Bill has planted. The blend is different each year, with the goal of showcasing the best of the vineyard in each vintage. The 2010 that we tasted was 44% Syrah, 26% Cabernet Franc, and 6% Cinsaut, with the remaining varieties all comprising 3% or less of the overall blend. Over 20 of the varieties for this wine were picked and co-fermented, while the rest were blended from barrels of the other field-blended wines. This was an intriguing and complex wine where no one grape variety stood out. 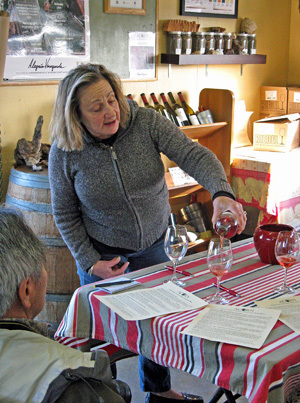 Following the “Medley,” Betsy went back once again to the Rosato, and it was interesting to see how our perception of that wine changed from our earlier sampling – she feels that tasters often don’t give full due to the first wine tasted. The one Acorn wine we didn’t try during our visit was their Dolcetto, which was sold out. The most recent 2010 vintage was a field blend of 92% Dolcetto, 5% Barbera, and 3% Freisa. I’d tried Acorn’s wines a few times in the past, but this was my first visit there. Betsy was a fine host for our group, and she gave us an enjoyable and educational presentation of the Acorn wines. Although Betsy had only met Jane before, she picked up quickly that we were all pretty wine-savvy and tailored her presentation accordingly. I’d say the style of the Acorn wines strike a good middle-of-the-road balance – they’re lively and food-friendly, with plenty of flavor and body while keeping ripeness and alcohol in check. And though the oak was apparent in most of the bottlings, it showed good balance with the fruit and other components of the wines. The Cab Franc, Sangiovese, and “Medley” blend were my favorites of the current line-up, with the “Acorn Hill” and Zin not far behind. This was a fun visit, and it’s worth setting up an appointment with Betsy and Bill at Acorn if you’re in the area. Jane and Warren took off after our visit to Acorn for lunch with some other friends in Sonoma, so the rest of us talked about where to go to eat in Healdsburg. We decided on Restaurant Charcuterie, just up the street from the plaza. This was my first meal there, and it was very good – it’s now added to my lengthening list of good dining options in town. We said goodbye to Jeff and Pam, who had to head back home right after lunch, and Dean, Kyoko, Mary, and I took a leisurely stroll around Healdsburg Plaza, checking out a few of the shops along the way. On our way back to Windsor, we stopped to pick up a few groceries for New Year’s Eve dinner and met Jane and Warren back at the timeshare. Our dinner that evening featured Dean’s paella – he’s made this dish for our group before and it never disappoints. It was time for another DVD and wine-themed game after dinner. This time it was Pulp Fiction and Wine-opoly, and Dean and Kyoko celebrated the New Year by teaming up to be the big winners of the game. As we’d done the previous year, we managed to use a good portion of our leftovers the next morning for a New Year’s brunch, including sake mimosas (a new New Year’s tradition). The late-December trips I’ve taken with my friends to Napa and Sonoma wine country have been a fun and relaxing way to end one year and ring in the new one. It’s good to take things easy and not try to squeeze too much into our schedule, so even though we only visited three wineries over two days in wine country, I didn’t feel like I missed out on anything. Year in and year out, visiting Steve and Carole at Lagier Meredith is a treat – it was easy to spend more time with them than we’d intended. 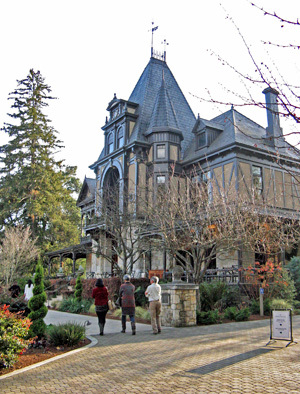 On this trip, Jane’s suggestion of visiting Acorn turned out to be a good one, and our stop at Beringer turned out to be a fine added bonus to our wine tour. Put all of that together with a couple of leisurely lunches, excellent dinners, and enjoyable company, and this was another short but memorable wine trip. As always, thanks to everyone that we visited for being so generous with their time and their wine!